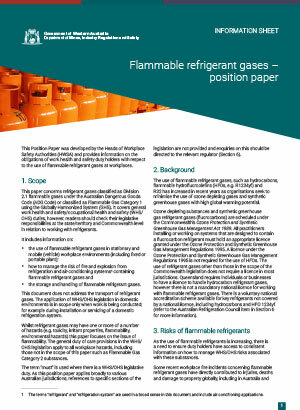 THE Heads of Workplace Safety Authorities (HWSA) has released a position paper on the use of flammable refrigerants in the workplace. “Refrigerant gases must be compatible with the refrigeration system. This determination must be made by a competent person, who has experience in this matter and who may have undertaken relevant formal training. A competent person is one who has acquired through training, qualifications or experience the knowledge and skills to conduct the task safely. “Converting a refrigerant system to use an alternative refrigerant must only be conducted in accordance with advice from the original equipment manufacturer or a competent person. A refrigerant should only be used in equipment that is designed or re-designed for its use. Significantly, the document stipulates that “the term ‘must’ is used where there is a WHS/OHS legislative duty. It also notes that while the definition “competent person” is not is not used in occupational health and safety legislation in Victoria, “the issue of competency, including relevant experience and training, is still pertinent”. The position paper also states that “refrigeration systems must be clearly labelled as to the refrigerant in use”. A section relating to the installation and maintenance of systems used in workplaces says that the compatibility of alternative refrigerants being considered “must be assessed and documented by a competent person prior to the substitution”. “A person changing a refrigerant to a more flammable refrigerant takes on a role similar to that of a designer of a refrigeration system”. This paper originates from a commitment made by former Environment Minister Greg Hunt that there would be a focus on flammable refrigerants following the Ozone Act review. Each state and territory may have a different version of the paper, although the content is expected to be more or less consistent. The main exception is Queensland, which has specific legislation covering hydrocarbon refrigerants. As VASA members well know, flammable and specifically highly flammable hydrocarbon refrigerants are already presenting a challenge in Australia. Since 2014 there have been with three serious incidents reported, resulting in two deaths and three serious injuries being recorded (the Perth truck blast, the Rochester Hotel explosion in regional Victoria, and a major fire at a large hydrocarbon refrigerant warehouse in Melbourne). VASA members are encouraged to download the position paper.